The first Greek stamps appeared on 1st October 1861. The Greek god Hermes, the messenger of the Gods in the Greek mythology, is the representation chosen by the Kingdom of Greece to illustrate its first postal stamps. Known as large Hermes head, the first stamps of Greece were produced in Paris, utilizing the dies from the first postage stamps of France. 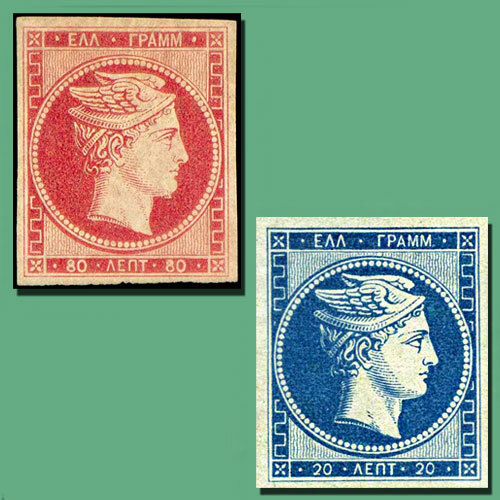 Hence the stamps of Greece and France look similar in appearance except for central vignette and top and bottom tablets that contain the name of the country. The seven Greek stamps were issued with seven colours and denominations ranging from 1lepta to 80 lepta and they stayed in circulation up to 1886, it was then replaced by the second type, the "small Hermes head".